Want to know what are the best, most amazing (and beautiful) backpacking trips in America? Here we go. The United States of America is the backpacker’s playground. All across the country you’ll find unique terrain, stunning views and incredible solitude. And that’s why it’s such a challenge to pick the best backpacking trips in America. There are so many incredible trails that provide one-of-a-kind outdoor experiences. In this guide, we show you what are the best backpacking trips and trails you can visit in the USA. The top six backpacking trips for beginner, intermediate and expert hikers. Best times to go on each trip. Typical duration of each trip. The distance you can plan to hike. 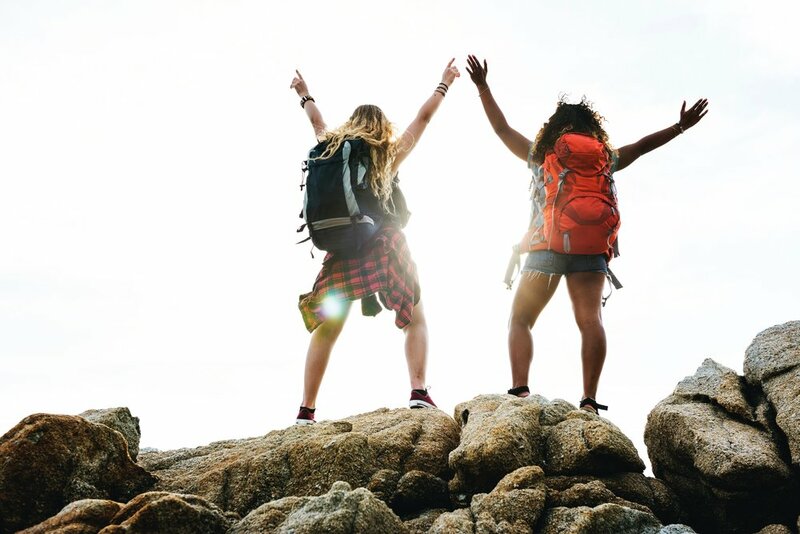 Specifically, we singled out the best backpacking trips by region including the Pacific Northwest, the Mountain West, the Northeast, Midwest, Southwest and Southeast. This list includes a backpacking trip in every corner of the Lower 48 states. If we had to nudge you in a direction, it’d be these six trips. Any of these trails and backcountry areas represent some of the most awe-inspiring and absolute best backpacking trips in America. The 100 Mile Wilderness backpacking trail is just as rugged and wild as the name suggests. This isn’t a trip for the faint of heart. It’s 100 miles of muddy, buggy backcountry terrain. But even so, the adventure is well-worth the pain. Here’s why: the 100 Mile Wilderness is the final leg of the Appalachian Trail (“AT”), aside from the final 15 miles in Baxter State Park. In fact, it’s the only stretch of the AT that doesn’t cross a paved road. And along the route, hikers are treated to stunning vistas, cascading waterfalls, sandy beaches, and even the occasional moose. In other words, it’s the ultimate way to experience the Maine Woods; rugged, wild and serene. Of course, you’ll be hiking part of the AT, and that means trail traffic. During July and August, the 100 Mile Wilderness it receives its fair share of visitors, especially in July and August. Even so, you’ll still find quietude and the ultimate endurance test. The trip requires careful planning, the right mix of gear, and a certain level of physical fitness. But if you do it right, the last 100 miles of the Appalachian Trail delivers a backpacking experience that’s equal parts challenging and rewarding. You can travel south to north (Munson, ME to Abol Bridge), or vice versa. The Wilderness’s northern terminus is the edge of Baxter State Park. There are shuttles on either end that will get you to the trailhead. Shaw’s Hiker Hostel and the Appalachian Trail Lodge, for example, can help, and there are numerous outfitters too. To say this hike is strenuous, is putting it lightly. Not only does the trail gain 18,000 feet in elevation, but weather in the North Maine Woods is notoriously unpredictable. That means two things: You need to pack for cold and wet weather, and a weather-tight shelter is a must. Camping: Typically, the route takes 6-12 days. And many outfitters will provide food drops along the way. (Food caching is great for cutting pack weight). There are 13 lean-tos in the Wilderness, as well as several campsites, which are available on a first-come, first-served basis. Permitting: Like most sections of the AT, you don’t need a permit to access the trail. Yet, if you plan to travel into Baxter State Park and summit Mount Katahdin, you’ll have to pay the entrance fees and obtain an AT Hiker Permit Card, which is available at the Katahdin Stream Campground. Food Caching: Coordinate with an outfitting company on food drops and shuttle service (in case you have to pull out). There are many logging roads that traverse the trail; outfitters offer food drops and shuttles at many of these crossing points. Fortunately, cell coverage can be found along the route, in case of an emergency. Weather: The weather can be unpredictable. In spring, the trail gets washed out and muddy, and the black flies start biting in June. Rain is common throughout the summer, and at any time, temperatures can fall significantly overnight. Maps and Info: The Appalachian Trail Conservancy is a rich source of information. Also, the Appalachian Mountain Club’s map is one of the best. 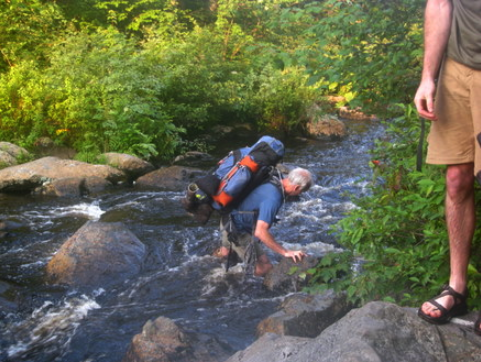 Bottom line: The 100 Mile Wilderness is one of the Northeast’s most challenging backpacking trips. If you’re in search of an adventure, you’ll find it here. This Mount Rainier National Park trail will quite-literally transport you to Wonderland. No joke. The terrain – which includes fog-blanketed old-growth rainforest, sub-alpine meadows, glacial lakes, waterfalls and canyons – feels otherworldly. But Mount Rainier is the star of the show. Anywhere on the trail, you’ll be rewarded with epic panoramas of the iconic peak. This isn’t a trek for the uninitiated, though. Wonderland is a massive challenge that will push your limits. The ascents and descents, nearly 23,000 feet in total elevation gain, can drain even the most experienced. Mosquitos and black flies bite with reckless abandon until after Labor Day. And the weather tends to turn on a dime. Expect rain, cold nights, muddy trails, and a few challenging river crossings. Yet, the adventure is worth the pain. There’s a reason Wonderland is on so many backpacker’s bucket lists. A trek in Mount Rainier is majestic, with glacial cirques (like Mowich Lake), Narnia-esque rainforests, and magic around every corner. Wonderland has numerous trailheads. Yet, backpackers tend to prefer the five major ones: Longmire, Sunrise, White River and Box Canyon. Each of these trailheads are accessible via roads, although some, like Mowich, can be difficult to get to depending on the time of year. Longmire and Sunrise are favorites, as they offer the most services. When hiking Wonderland, prepare for the unexpected. With so many different micro-climates – rain, cold, humidity, etc. – it’s important that you’ve packed the right gear. A weather-proofed tent is a must, and a waterproofed backpack will help keep your gear protected. Camping: The Wonderland Trail has 18 campsites located along the route, with several individual tent sites at each. Campsites are equipped with pit toilets, bear-resistant food storage, and all are located near a water source. Permitting: All thru-hikers on Wonderland must obtain a permit through the National Park Service. Permitting is done through a lottery system; you can sign up for priority booking March 15 to April 1. It’s highly recommended that you book in advance during the priority period. Although some walk-up passes are permitted, your odds aren’t great. Resupply/Water: With so many ups and downs, food caching can help you keep your pack weight more comfortable. You can manually cache your own food at four sites. Plus, the Park Service allows food caches to be shipped at least two weeks prior to your take-off. Fuel caches must be manually placed. Water can be found along the trail. Weather: The Wonderland can throw anything your way. From mid-July to mid-August, rain is common, with overnight temperatures dropping into the 40s. By mid-August, temperatures stay fairly mild, but still, it’s smart to pack for cold weather. After Labor Day, temperatures start to fall in the evenings, and snow begins its descent from higher elevations. MOUNT RAINIER: ONE OF BEST TRAILS IN AMERICA FOR BACKPACKING AND HIKING. Maps and Info: The NPS website has everything you’ll need, including maps, food caching info, road statuses, and permitting FAQs. Hiking the Wonderland Trail: The Complete Guide and National Geographic’s Wonderland Trail maps are also helpful resources. The Wonderland will challenge you with its descents and ascents. 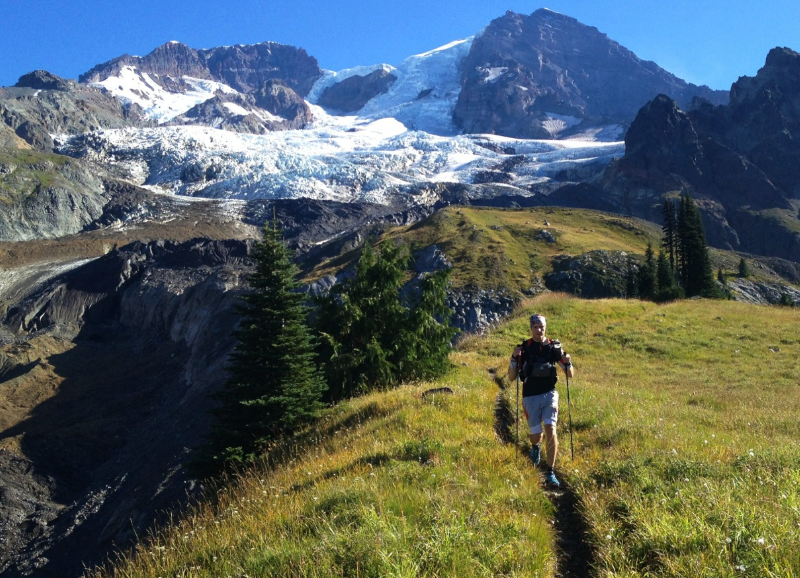 Yet, with Mount Rainier as your backdrop and majestic vistas and scenes along the way, the climbs are worth the effort! The North Country Trail spans 4,600 miles from North Dakota to New York. Yet, one of its most scenic sections – the Pictured Rocks National Seashore – provides a backcountry escape unlike any other in the U.S.A. Pictured Rocks hugs the coast of Lake Superior, and its towering sandstone bluffs give the route its signature name. This is such an expansive trail that it takes you all the way from New York to North Dakota, or vice versa. There’s a lot to love about Pictured Rocks. For starters, it’s a moderate route – about 200 feet at its highest – and that makes it great for relatively green backpackers. And the scenery is to die for. The route takes hikers past deserted sandy beaches, majestic sandstone arches, swamps, waterfalls, and picturesque lighthouses. In fact, in some stretches, the crystal clear, turquoise water wouldn’t look out of place in Amalfi. Pictured Rocks runs from Grand Marais, MI to Munising, MI, and the 42-mile stretch can be reached from either end. There’s also access points throughout the route with parking, if you’d like to hike a shorter section. Throughout the year, hikers take to the Pictured Rocks trail. The weather and trail conditions are fairly consistent, although winter does bring ice and snow. In terms of gear, pack for rain and cold; in spring and fall temperatures can drop significantly overnight, into the 40s or high-30s. Camping: Pictured Rocks has 14 backcountry campgrounds throughout, with multiple sites at each. There are also several group camping sites that have access for 7 to 20 people. All are located near water (a stream or lake), and some have communal campfire rings. Bear canisters are also available at each site. Permitting: A backcountry permit is required when hiking in Pictured Rocks. All permits can be purchased online – through recreation.gov – and permits cost $15, plus $5 per person per day. 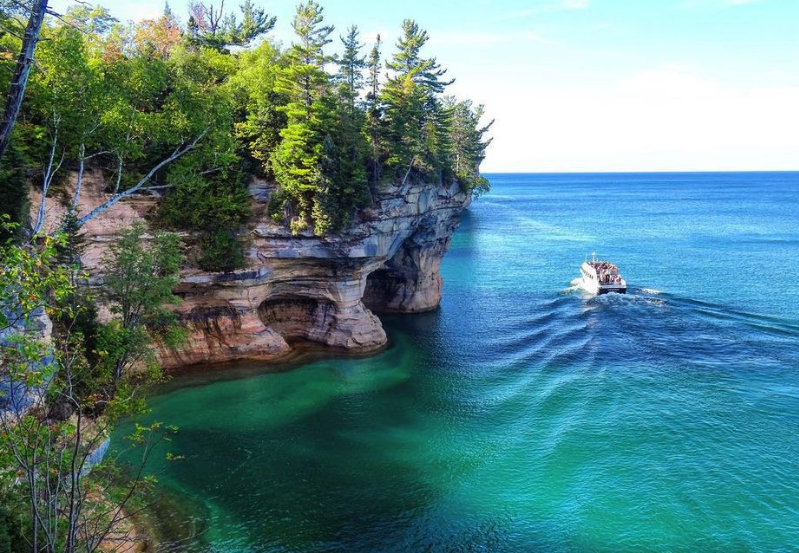 Weather: Pictured Rocks has a fairly mild climate. The spring season starts in mid-April, with temperatures in the 40s. Overnight temperatures can fall significantly. By mid-May temperatures begin reaching into the 60s and 70s. Rain is common in spring, but begins to taper off in summer. Fall temperatures through October remain fairly moderate in the 50s. Resupply/Water: Water sources are available at every campsite, and there are creeks and streams along the way. Bugs: The flies can be a pain, especially from mid-May until Labor Day. Stable flies, in particular, are a nuisance. Plan spring or fall treks to avoid the flies, or plan to hike in long sleeves and netting in summer. Maps and Info: The NPS website offers lots of helpful planning tips and maps. Also check out the North Country Trail Association, if you want to expend your trip. The association’s book is a great resource for North Country trekking. Pictured Rocks National Lakeshore transports hikers to a coastal oasis that’s stunningly beautiful. It’s one of the best trips for beginner to intermediate backpackers. The Benton MacKaye Trail (“BMT”) takes its name from the New England conservationist and forester who dreamed up the Appalachian Trail (“AT”). And it shares a lot of similarities with its sister trail. Yet, compared to the AT, which it shares a southern terminus with, the Benton MacKaye is wilder, more rugged, and decidedly less crowded. In fact, some compare it the AT experience of the 1970s. The BMT is one of the southeast’s newest long-distance trails. It was officially opened in 2005, and it’s maintained by an army of volunteers. (Even so, in some places, it’s a bit untamed.) But thanks to being relatively new, the BMT is mostly undiscovered. No big crowds; you may go a day or two without seeing another sole. Beyond the solitude, this is pure Appalachian hiking. You’ll wind through giant rhododendrons, cross rushing creeks, traverse eight different wilderness areas, and spend about 93 miles in the Great Smoky Mountains National Park. In short, the BMT delivers a true off-the-grid, deep backcountry experience. The Benton MacKaye Trail runs from Springer Mountain in Georgia, to Davenport Gap, TN. There are numerous access points along the trail, if you’d prefer to section-hike. Plan for a quiet adventure in some of the most remote backcountry in the southeast. The weather tends to be humid in summer, but much milder in spring and fall. And there’s resupply and camping spots throughout. The summer weather makes this a great hammock camping spot. Camping: Unlike the AT, the Benton MacKaye only has two permanent shelters throughout its 288-mile course. Instead, plan on disperse camping. There are plenty of water sources near the trail, so you don’t have to worry about hydration. Permitting: You don’t need a permit for the majority of the BMT. In Great Smoky Mountains National Park, though, hikers are required to obtain a backcountry permit. If you’re heading north, you can pick one up at Fontana Village. Resupply/Water: The BMT’s resupply network isn’t as advanced as the AT’s, but there are numerous businesses, general stores, restaurants and inns along the route. Check out the Benton MacKaye Trail Association’s resupply resource for ideas. Weather: The southeast can get hot in summer, so plan for humid, sometimes sweltering weather. In spring and fall – popular times to hit the trail – weather tends to be milder, but temperatures can drop overnight. Rain is also common in spring and fall. ONE OF AMERICA’S BEST PLACES TO GO BACKPACKING. Maps and Info: The Benton MacKaye Trail Association is a wonderful source of information, and they offer several guidebooks in their store. A handy resource like the BMT Pocket Trail Profile is great for your pack, as well. Duration: Depends on starting point. Canyonlands National Park contains Utah’s best backpacking and hiking trails, and it receives its fair share of traffic. Yet, the majority of visitors stick to the park’s Island in the Sky district, which sits right in Moab’s backyard. It’s the Needles district, though, that draws backpackers and adventurers. The namesake sandstone spires, ancient ruins and awe-inducing arches make this one backpacking’s bucket list destinations. Rugged trails crisscross the district; there are 60 miles of trail in total. And there are numerous multiday routes that show off the region’s geologic majesty. The Salt Creek Canyon, for example, offers a 22.5-mile excursion with picto-graphs, Anasazi ruins, and beautiful arches right off the trail. Many say the Chesler Park area is the park’s best. Chelser Park, when combined with Joint Trail, forms an 11-mile loop, perfect for a long day hike, or a multi-day when combined with Druid Arch Trail. The Needles district sits about an hour and a half south of Moab, UT. And it’s accessible by paved roads. Squaw Flat Campground serves as the primary jumping off point for the best backpacking trips in Needles. The Needles showcases some of the most stunning terrain in the Southwest. And it’s the ultimate in desert trekking. Of course, that means it gets hot in summer; spring and fall are the best times to travel here. Yet, if you don’t mind the heat, you’re in for a show. Camping: The Needles requires backpackers to reserve spots in designated campgrounds. Although a few areas allow for at-large, or disperse, camping. There are several primitive backpacking campgrounds in the district, as well as several backcountry car camping spots. Permitting: Permits are required for backcountry hiking in Canyonlands, and they can be purchased online. Demand is high in spring and fall, and advanced reservations up to four months are strongly recommended. Resupply/Water: Water is a key resupply item, and it’s often hard to come by in many areas of The Needles. It’s highly recommended that backpackers bring any and all water that they will need. Weather: Spring and fall offer the mildest weather in the park, with temperatures hovering into the 60s and 70s. Overnight, temperatures can get brisk. Summer can be sweltering. ONE OF MOST SCENIC, BEST VIEWS OF UTAH’s Top BACKPACKING TRAIl. Maps and Info: The NPS website offers tons of great information about backpacking in Canyonlands, including maps, permitting information and other FAQs. The National Geographic map is one of the best. The Needles is one of the most stunning landscapes in the Southwest, if not the entire U.S. And the area offers plenty of opportunities to seek solace in the desert. The Four Pass Loop in the Rockies is a high-altitude adventure and Colorado’s best for backpacking. It takes backpackers over four high-alpine passes in the Elk Mountains. Be prepared to huff and puff along the way; altitude sickness is common among the unacclimated. Yet, if you’re up to the challenge, Four Pass Loop puts on a dazzling display of Colorado’s finest: meadows chock-full of wildflowers, alpine lakes, aspen groves, and of course, the stunning Maroon Bells. Be sure to rise early; the sun dances off the Bells in the morning. The loop travels over four rugged passes: Frigid Air Pass, Trail Rider Pass, Buckskin Pass, and West Maroon Pass, each providing unforgettable views. If you’re looking for one of Colorado’s best backpacking trips, this is it. The Four Pass Loop is classic Colorado, and it’s highly ranked by nearly any expert backpacker. The Loop is located about 45 minutes from downtown Aspen. In summer, you can park at West Maroon Portal in the White River National Forest; but be advised, parking is only permitted in the morning and evenings during summer. If you’re arriving later in the day, a shuttle is available from Aspen Highlands resort. Most take off from Maroon Lake, and you can travel clockwise or counterclockwise. top hiking trails and trips in the rocky mountains. The Four Pass Loop is a show-stopper. The grey and auburn-hued peaks are stunning, and the trail couldn’t be more well-maintained. It’s quite popular in summer; but if you don’t mind the cold, fall is best, when the aspens start changing. Just be sure to bring a cold weather sleeping bag and a tent designed for the extremes. Camping: Disperse camping is not allowed in the recreation area. Yet, there are numerous campsites along the trail, each of which are clearly marked. Campsites cannot be reserved, so it’s recommended to arrive in camp early to find a spot. Permitting: Permits are required for overnighting in the Maroon Bells-Snowmass Wilderness. Permits are free, and guests are required to self-register at the trailhead. Resupply/Water: There are several water sources in the area, including Maroon Lake. how, when, and why you should visit colorado for hiking and backpacking trips. Weather: Weather is unpredictable in the Elk Mountains. It’s best to travel early in the day, as torrential rains and hailstorms are common after noon. An extreme weather tent and cold weather sleeping bags are musts. In spring and fall, the weather is quite cold, with snow common. In summer, temperatures are milder, with highs climbing into the 60s. But weather can turn quickly, no matter the time of year. Maps and Info: The Forest Service has some helpful information about the area. And be sure to check out the National Geographic maps for the Maroon Bells area. Four Pass Loop is one of the best in the west. If you’re looking for an escape in Colorado, it doesn’t get much better than this. And plus, Colorado is known as a hikers’ paradise, offering some of the best hiking and camping trails in the United States. The Redwood National and State Parks is California’s most beautiful backpacking and hiking trail. You need to make at trip to this scenic area of America and be sure to see the trip highlights below. Beyond the beautiful - and massively-sized - Redwood trees, this scenic route will allow you more coastal views than many of the backpacking trips above. If you are in California, we highly recommend you go for a jaunt on the Redwood National and State Parks trails. What Are Your Favorite Backpacking Trails or Trips in the USA? These epic hikes represent some of the finest multi-day trekking in America. Did we miss one of your favorites? Let us know. Connect with Angel Outdoors on social media and tell us where we should go next! Also, be sure to check out our gear reviews, for the latest in greatest in outdoor gear. 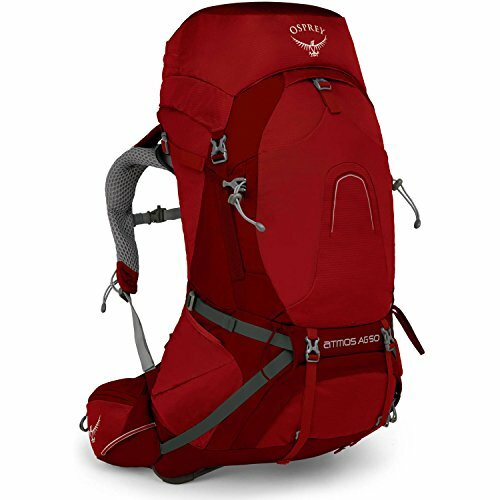 the best hiking backpacks and more. Get in touch with us if you explore some awesome trails and trips from above. We would love to see your photos and connect with you!